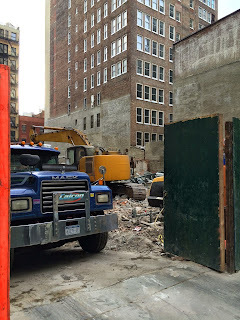 The Antiques Garage closed this past summer to make way for a luxury hotel tower. Hey great! We sure could use another one of those cookie-cutter luxury hotel high rises huh? Especially since it was just announced that by next year the top 1% will own 50% of the world's wealth! I'm born and raised here and I honestly feel like an "outsider" in my own city. Tell me about it...ugh...never thought it would come to this. I feel EXACTLY the same way, & beyond thoroughly disgusted & frustrated. There is no going back. I tell people all the time that you either accept the luxury and boredom of the city or you should move. The city won't suddenly be what it was. Those days are gone. Those businesses and history are destroyed. The real character of the city has either died or moved away decades ago. The only thing that would shut down these luxury businesses and homes is a collapse of our economy and I don't think anyone would want to live in NYC when that happens. Just say good bye to it and move on. Either live among the uber rich and pay for the privilege or, do as I have decided to do, pack it up and leave with my memories still partially in tack. I believe you mean "intact" - but in any event, since you've already waved the surrender flag - where, may I ask, are you decamping to? NYC is still tops. Tons of museums and art galleries! Anonymous 7:11 PM, you're right about NYC being pretty much at the point of no return, but when you mention "a collapse of our economy" and say that no one "would want to live in NYC when that happens," I agree but also would remind you that this has happened more than once in the last 45 years, and New Yorkers weathered it, sometimes better than other times. Our most recent economic collapse, in 2007-8, which hammered Wall Street and the banks, and as a result, millions of homeowners, did not have to result in the steadily increasing economic inequality and hypergentrification that we're living through. If the federal government had not decided to prioritize helping the banks and global corporations in favor of middle and working class Americans, things might have turned out differently. Instead, we've mostly seen policies that, while economically sound in textbook economic terms (federal monetary policy, Obama's very limited fiscal policy when he had a Democratic Congress in 2009-2011, etc.) has done little to help the majority of Americans, who are seeing wage stagnation or even decreasing earnings, as the top 1% grows richer and richer. Even letting the country go over that "fiscal cliff," which the media made sound like a second Great Depression, would have reset federal marginal income taxes, especially for the top 1%, better than what we ended up with. Now the billionaires have sweetheart deals when they buy luxury condos in Manhattan (cf. Sheldon Silver's indictment), lower federal marginal tax rates and capital gains taxes than under Reagan, and on and on. The game is rigged in their favor. Short of an economic collapse, which I don't want but which New Yorkers have lived through more than once, we need to reset the game and make it fairer. Unaffordable real estate, low wage jobs, cut rate taxes for the wealthiest, increasing wealth concentration, minimal spending on infrastructure repair and development, and all of the rest of the neoliberal/laissez-faire policies bode ill for America's future!